Currently the tallest building in the world, the Burj Khalifa dominates the skyline of Dubai. Seen as far as a distance of 92 kilometers, it is usually the first sight that people see when they arrive in the metropolis. This is a building that calls us to be personally reflective in spaces of pure harmony and to be grand in our own aspirations, just as the building itself. Why Is The Burj Khalifa So Famous? What Is There Inside The Burj Khalifa? Considered as Dubai's most visited attraction, Burj Khalifa is famous the world over for being currently the tallest building. The massive building was visited by a record number of visitors in 2013, with 1.87 million tourists going on its floors to gaze over the whole city. One of the building's biggest attractions is the observatory deck. Located on the 124th level, more than half of the tourists who stopped by the Burj Khalifa's observatory were international tourists. Although the observatory deck is its greatest attractions, it is only located at a little over 450 meters above the ground and the total height of the building is 828 meters. 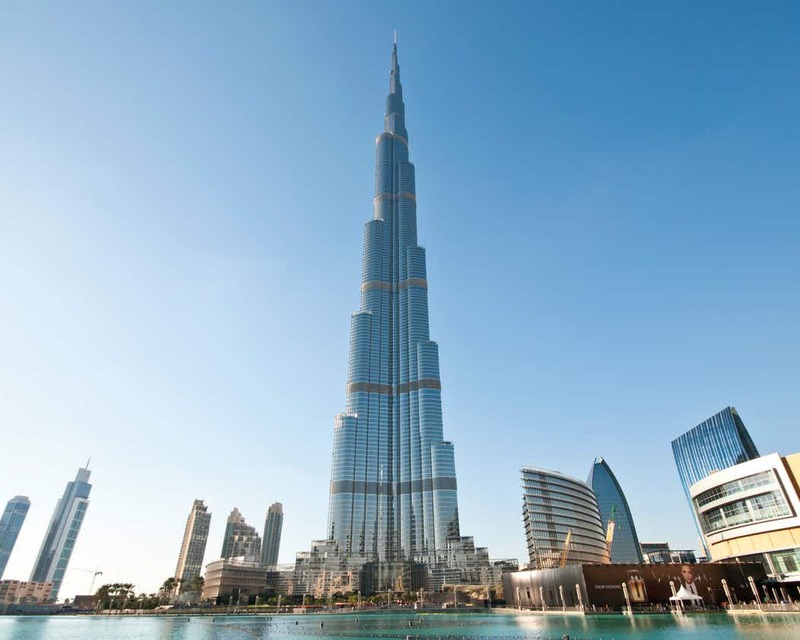 The Burj Khalifa is the tallest building in the world with a height of 2716.5 feet. Its total height from the tip to the base is 2723 feet or 829.8 meters. The building has 163 floors located above the ground and only one floor located below the ground. it has 58 functional elevators which run at a top speed of 10 meters per second. There are 304 hotels and 900 apartments in the Burj. Initially named as Burj Dubai, the building was proposed in 2003, but construction only started in 2004 and was completed in 2010. The Burj Khalifa is 3 times as tall as the Eiffel Tower and two times taller than the Empire State Building. Twelve thousand construction workers were engaged daily during peak construction days. Burj Khalifa requires a supply of 250,000 gallons of water daily and total electricity consumption of equivalent to the electricity consumed by 360,000 bulbs of 100-watts all burning at the same time. It is the home of the first Armani Hotel. A substantial amount of rebar was used during the construction of Burj Khalifa that if they were laid end-to-end, the total length would be a quarter of the total way across the globe. Because of its height, the building has a specially designed elevator system for controlled evacuation for emergency situations such as fire and security threats. The Hymenocallis flower served as the design inspiration of the building. The flower has long petals extending out from the center. 26,000 glass panels individually cut were used to create the building's exterior. The total aluminum used in the tower weighs as much as five A380 aircrafts. The total concrete used in the tower weighs as much as 100,000 elephants. 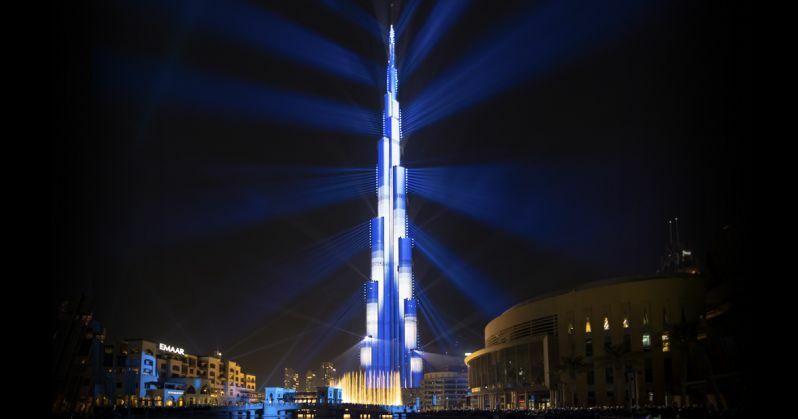 Burj Khalifa earned two Guiness World Records, namely, "Largest illuminated façade and Tallest LED-illuminated façade on the 31st of December 2018. The Burj houses the world's tallest art gallery with commissioned works from more than 85 artists from all over the globe. Burj Khalifa, the tallest building in the world, has many floors and has a massive space. There are 160 floors which are habitable, the most of any building in the world and the different levels serve various purposes. 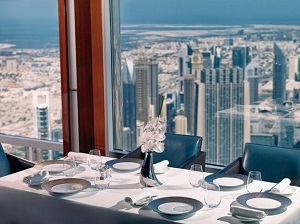 Considered as the peak of fine dining in Dubai, At.mosphere is located on the 122nd level of the world's tallest building and it offers an exquisite array of wonderful gastronomical wonders with breathtaking views of the Arabian Gulf. All dishes are served with ingredients sourced from all over the world, some of them grown exclusively to be served on their tables. You may take a look at the restaurant's menu here. Make the most of your time in the At.mosphere by choosing window seats during high tea so you can experience breathtaking views from the world's tallest restaurant. Admire the beauty of the city below by looking through glass-paneled rooms which offer unobstructed views of the desert, sea, and the metropolis of Dubai. The Armani Hotel reflects the elegance, simplicity, and sophistication that embody the designer's signature aesthetic and style. It brings to life the brand's philosophy, excellence in service. Within walking distance to the Dubai Mall and located in the iconic Burj Khalifa, the Armani Hotel is the pinnacle of fine dining and luxurious living. It is also the home of the Armani Spa which offer a unique treatment experience and exclusive services designed to help guests regenerate and unwind. If you are after culinary indulgence, you will definitely enjoy your stay in the Armani Hotel as it features exquisite menus and innovative dishes prepared by some of the world's top chefs. The price for a night's stay in the hotel starts at $700 and varies depending on the room type. Offers 45 square meters of understated luxury where guests are showered in bespoke Armani furniture sets for a peaceful sleep. Fitted with a king-sized bed, individual shower and bathtub, personal butler station complete with a coffee machine and private bar. Offers 70 square meters with a separate entrance vestibule and private living room fitted with bespoke Armani furniture. Fitted with a king-sized bed, individual shower and bathtub, personal butler station complete with a coffee machine, as well as amenities designed by Giorgio Armani himself. Offers 95 square meters and equipped with a living room with the latest technology and a personal butler station. Also has a king-sized bed and a beautifully appointed bathroom. Offers 95 square meters of space with a breathtaking view from your very own balcony. Comes with a living room equipped with the latest technology, a personal butler station, and an oversized bed. 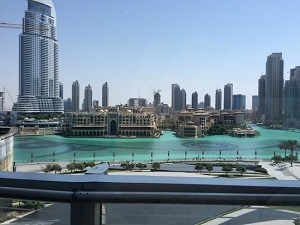 Offers 80 square meters of space with splendid views of the Dubai Fountain. Comes with a 40-inch LCD flat screen, DVD players, multi-functional workstations and printers on request. Offers 80 square meters of space with splendid views of the Dubai Fountain. Comes with a 40-inch LCD flat screen, DVD players, multi-functional workstations and printers on request. With the balcony, you have your own personal nook where you can admire the fountains. Comes with a king-size bed, personal butler station with private bar and individual coffee machine, as well as bespoke fabrics created especially for the hotel. Also includes a 40-inch LCD flat-screen TV, DVD players, multi-function workstations, and printers on request. Features a separate living room and entrance vestibule with closet. Offers 150 square meters of space which includes bespoke furniture, multi-use workstation, DVD players, 40-inch flat screen LCD, king-size bed, a separate living room, and separate storage space. Offers 150 square meters of space which includes bespoke furniture, multi-use workstation, DVD players, 40-inch flat screen LCD, king-size bed, a separate living room, separate storage space, as well as a private balcony where you can take in breathtaking view. Offers a massive 235 square meters of space that includes a spacious bedroom, separate living and dining rooms, complete with a full-service pantry and bar, private study, and an impressive circular entrance hall with a powder room and storage closet. Unrivalled 390 square meters of space of pure comfort, luxury, and relaxation. It comes with a private full-service bar and pantry and offers breathtaking views of the city. The Burj Club gym assures fitness sessions aided by professionals and done using state-of-the-art equipment while being surrounded by spectacular views of the city. There is also a semi-Olympic size indoor lap pool where guests can take a dip after working out. There is a range of gym and pool memberships to choose from in this Miami-meets-Manhattan venue. Another thing to look forward to is The Burj Club's rooftop brunch. Serving fruity drinks and delicious food amidst dazzling sunshine is something to experience. The Burj Khalifa is located in downtown Dubai, right beside the Dubai Mall. You can get to it by using various modes of transportation. Dubai Metro, take the red line to Burj Khalifa station. Take the F13 bus from there and get off at the next stop, which is the Dubai Mall bus stop. Dubai Metro, take the red line to Burj Khalifa station. Walk to the mall via an air-conditioned overpass. This walk takes about 15 minutes, and there are moving walkways to ease your journey. Once you get to the Dubai Mall, just walk through the mall to the Lower Groudn Floor. 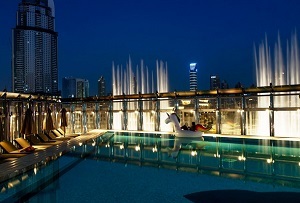 The ticket office to the Burj Khalifa is within Dubai Mall, near Subway sandwich restaurant on the Lower Ground floor. There are two observation decks in the Burj. The lower deck is called "At The Top" and stands at a height of 452 meters. When it opened in 2010, it was the highest observation deck in the world. The other observation deck is called "At the Top Sky” which stands at a height of 555 meters, and it is currently the highest observation deck in the world. It was built only after an observation deck in Canton Tower, China, surpassed the first observation deck in Burj Khalifa. The very top is the 163rd floor but it is not accessible to the public. Before the Burj Khalifa was completed, the tallest building in the world was Taipei 101, located in Taipei, Taiwan. The Burj Khalifa is three times as tall as the Eiffel Tower and two times taller than the Empire State Building. Ticket prices based on the observation decks you choose and what time of the day you stop by. Prime hours for "At the Top" are between 3:30 and 6 pm, a great time to witness the sunset and spend some time on the observation decks. The Burj Khalifa is mesmerizing and once you enter the building, you will get spellbound by what it holds within. After you enter the ground floor, you will be given with a welcoming fresh brewed Arabic coffee served with Arabian dates. Your journey to the Burj Khalifa can also be likened to an educational tour as you can learn a lot of things about the building while watching interactive displays inside. Aside from the architecture and design, you will also be amazed by the technology. The world's fastest elevator is in the building, traveling at a speed of 10 meters per second. There may be a queue for the elevators so getting on may take some time. A lot of people ask if it is better to visit the Burj Khalifa during day or night. The answer depends largely on your budget and your intent. As previously outlined, ticket prices vary according to the time frame. If you are a photographer who want to take professional photos, then it is best that you go during peak hours or between 3:00 and 6:00 pm. If you want to take a shot of the Dancing Fountains below, then you can stay a little longer until the show starts. If you have a limited budget and does not mind if you get a photo during day or night time, then choose the non-peak hours. Go in the early morning or in the early afternoon so you can save money and also get excellent views. There are three observation decks in the Burj, one each on levels 124th, 125th and 148th. You have to pay more if you want to go to the 148th level but you get to enjoy a personalized tour with a Guest Ambassador guide. The outdoor terrace at level 148th is 555 meters above the ground. There you will also be able to refresh yourself with signature refreshments at the SKY lounge, which you have to pay separately, if not included in your ticket. The other observation decks are on levels 124th and 125th which guests may explore at their own pace. The observation deck at level 125th is 456 meters above the ground. All observation decks provide a 360-degree view of the city. One of the symbols of the Middle East and the most popular building in the Dubai metropolis, the Burj Khalifa welcomes millions of visitors annually. 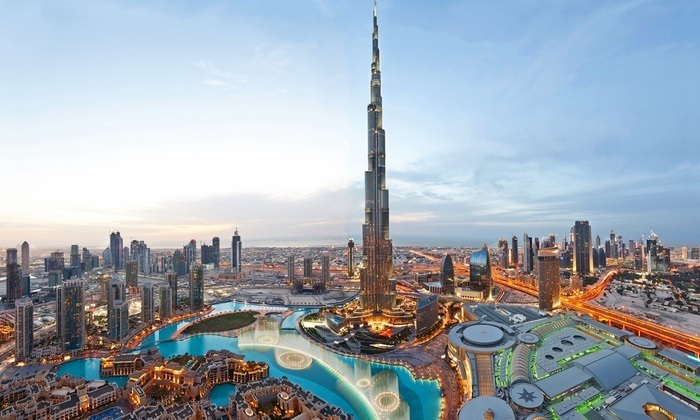 It is important to plan your visit to the Burj Khalifa before even setting foot in Dubai. Doing so will help you plan your time well and ensure that you maximize your visit to the city. Tickets to the observation decks get booked quickly, so in order to secure a slot and avoid the long lines it is advisable to purchase tickets in advance and take advantage of skip-the-line tickets and tours. There are also plenty of Dubai attraction tickets which you must absolutely check. You can't go wrong when you visit any time of the day, but most people agree that the best time to visit is just before sunset. This gives you the chance to see the city during day and night time. Given that tickets for prime hour costs more, you will be happy to know that you can get good value for it. Keep in mind that you can also stay on top for as long as you lie. Remember to wear sensible and comfortable shoes as you will be walking around and exploring, not to mention the queues for the elevator. It also wise to eat something before going up to the observation deck, because bringing food and water is not allowed. There are plenty of restaurants on top so do bring cash if you would like to enjoy a meal there. It should also go without saying that you should bring a camera or a smart phone so you can take Instagram-worthy photos while there. Dubai is a luxurious and extravagant city and going there means spending a substantial amount of money. Even if you have plenty to spend, it is still wise to check deals and ensure that you get the most bang for your buck. It is only proper that you get your money's worth and have a jolly good time too! No need to worry as we did all the hard work for you. We have checked all Dubai city passes and narrowed the list to 10. 'Highlight was the dinner - food was great and plentiful - views were awesome with fountain displays. Dubai has plenty to offer aside from the Burj Khalifa. This bustling metropolis is vibrant and rich in culture that there are so many things to enjoy and discover. We have rounded up some of the top attractions near the world's tallest structure which you should also explore. Considered the world's largest shopping center, the Dubai Mall is part of the Burj Khalifa complex. It features 1200 shops and it is accessible via Doha Street, which has been rebuilt as a double-decker road. Some of the prominent attractions in the mall are the Gold Souq which has more than 200 retailers, a 22-screen Cineplex, SEGA indoor theme park, Oasis Fountain Waterfall, and Galleries Lafayette department store. If you happen to love shopping, this is the perfect place for you. Listed on the Guinness World Records as the largest flower garden in the world, it features 45 million blossoms and is a breathtaking location for people to take pictures in. Take friends and family with you and don't forget to selfie stick because you'll need it. Kidzania is a great place to go to if you have children with you. It is an establishment that aims to teach children between the ages of four to sixteen and encourages them to role-play a few activities adults do in real life. Children carry out certain jobs such as being a police, doctor, or firefighter and rewards them with fictional currency. Located on the ground floor of the Dubai Mall, the Dubai Ice rink appeals to people of all ages. The attraction boasts of a vibrant dance floor and a lively venue for different types of events. Perfect your skills by freestyling or joining the disco session. Strategically located at the center of Dubai Mall, Dubai Aquarium is one of the largest indoor aquariums of its kind. Visitors have the chance to witness one of the most diverse collections of aquatic life as it showcases more than 33,000 aquatic animals. Dubai is a vibrant metropolis which thousands of locals and expats call home. Its varied population make it a melting pot of cultures and history and it is worth exploring both day and night. There are several things to do in Dubai night, as well as during daytime. If you are pressed for time, there is also the Dubai hop on hop off bus which will take you to all the key attractions, albeit for a limited amount of time. Just be sure to take the free Dubai attractions maps with you so it is easier to navigate the city. Duration: 24 hour ticket, 48 hour tickets also available. Duration: 2 hour cruise. Evening lasts 2-3 hours total.